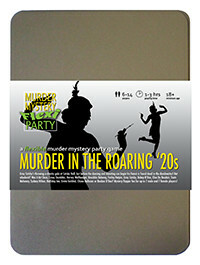 You've been invited to play the role of GRETA GARBLED in Murder in the Roaring '20s. Gray Catsby has invited his most talented and wealthy friends to a charity gala event at his countryside residence, Catsby Hall. But before any dancing and donations begin, Catsby’s fiancée, Ginger Whiskers, is found dead in the dumbwaiter! Join the flappers and dappers to find out who finished her off! If you’re not wearing your hair up in a sequin pinned scarf, your permed playful ringlets bounce on your delicate chiffon dress. Shaded eyes and dark red lipstick complete the look. Who is Greta Garbled? A doting wife, a spy, a femme fatale? You play so many roles, the real Greta has been somewhat lost. But one thing’s for sure - you’re always glamorous, always mysterious, and always just out of reach… You’re so Hollywood, dahling, they might as well change the name to Gretawood! Dahlings, please, let’s not make a fuss. Yes, I’m Greta Garbled - famous star of the silver screen. I’m was in the area to attend the premiere of my latest film, “The Maltese Icepick”, so naturally I had to visit my dear, dear friend Gray Catsby. We’ve known each other for years. Poor Gray! Ginger seemed like such a swell kid. “Maybe she had it coming, maybe she didn’t - but it had turned up nonetheless and it was everywhere.” That’s a line from my film.